The TBEI Sisterhood Book Club meetings are held the first Tuesday of the month at 12:00 noon in the TBEI library. 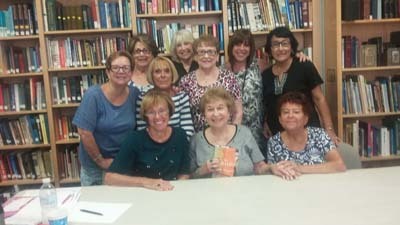 The Book Club has been an active group for more than eight years. Typical attendance at the meetings ranges from eight to fifteen participants. The criteria used to select books for review include Jewish theme, Jewish author, or perhaps just a fantastic mainstream book that the ladies choose to read. The only requirement for participating in the book club is membership in Sisterhood. Consider joining the Sisterhood Book Club and enjoy reviewing selected books with a group of lovely and friendly young ladies. The next meeting will be Tuesday, March 5…at 12 noon. Any questions, please contact Belle Sidel at 772.785.5337 or ringbelle17@bellsouth.net.